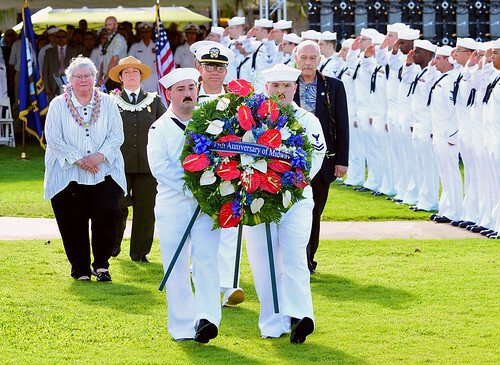 PEARL HARBOR - Joint Base Pearl Harbor-Hickam will host a commemoration ceremony at WWII Valor in the Pacific National Monument, June 1 at 8 a.m., to mark the 76th anniversary of the Battle of Midway. The public is invited to attend the ceremony at the Pearl Harbor Visitor Center's education lanai and explore the center to learn more about the history of World War II. Ceremony highlights include music from the U.S. Navy's Pacific Fleet Band, remarks by Navy Region Hawaii Commander Rear Adm. Brian Fort, and a wreath laying presentation at the Lone Sailor statue. The Battle of Midway, a pivotal engagement in the Pacific Theater of World War II, occurred six months after Japan's attack on Pearl Harbor. From June 3-7, 1942, the U.S. Navy decisively defeated an attacking fleet of the Imperial Japanese Navy near Midway Atoll, inflicting devastating damage on the Japanese fleet that proved irreparable.